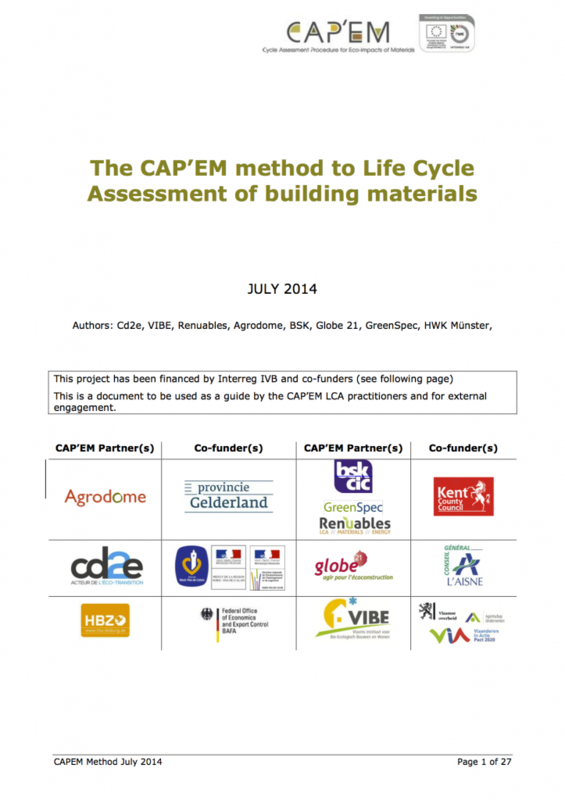 GBE PASS can be a counterbalance to or complimentary with Life Cycle Analysis (LCA) that is promoted by EU as the only credible way for a manufacturer to promote its ‘Green’ credentials. NGS has been in existence since 2001 but GBE PASS was introduced much more recently. NGS initially judged materials and products or systems, before LCA had established itself, on a less formal system with 57 criteria more rencetly with 400 listed on the website, at GBE Criteria. GBE PASS is part of GBE Code, it informs the content of GBE Product Pages, all products on GBE will pass GBE PASS when assessed or have already done so. GBE PASS considers the positive properties and positive contribution a material or product has to make in its application in a building, if it is healthy, resource efficient in production application and use, checking its performance or the improvement of performance of an adjacent material or product, its ability to reduce consumption of other resources over the life of the building. GBE LitAudit is a simple process of reviewing manufacturers promotional material: website page content, attached PDF files: promotional and technical literature, Specifications, CPD Seminars, Illustrations, CAD files and advertising, checking for Greenwash and checking validity of any statements or claims. Once information is gathered together the process is usually a days work to review and record. But if more information is required the process takes as long as information flow dictates. GBE Compare applies any calculations necessary to determine comparable data. GBE PASS then compares individual products to determine where and how they are better or worse than the average or normal. GBE Compare encourage manufacturers to bring their latest product data to improve the collection and improve the average. Manufacturer and suppliers would be unhappy with paying for the NGS PASS assessment to be told they failed. We operate a kind of ‘per-MOT’ that largely ensures that we’re pretty sure of the outcome. We will decline to assess a product that is likely to fail and warn if it is borderline. Then we record: How is this product better than ‘normal’ or ‘average’ product in the same category? With at least one benefit (ideally many) but also more benefits than problems, the product gets GBE PASS. The information is issued to the manufacturer for review in case we have misunderstood and edited accordingly. We try to keep the overall processing time down to a maximum of one day to ensure the costs are kept low. If the product gets a GBE PASS then it is eligible for an GBE Product Page. In the background GBE PASS currently considered 400 criteria (the list continually grows), predominantly positive characteristics and to ensure we do not ignore the negative aspects they are there too, including: Does it have an LCA? 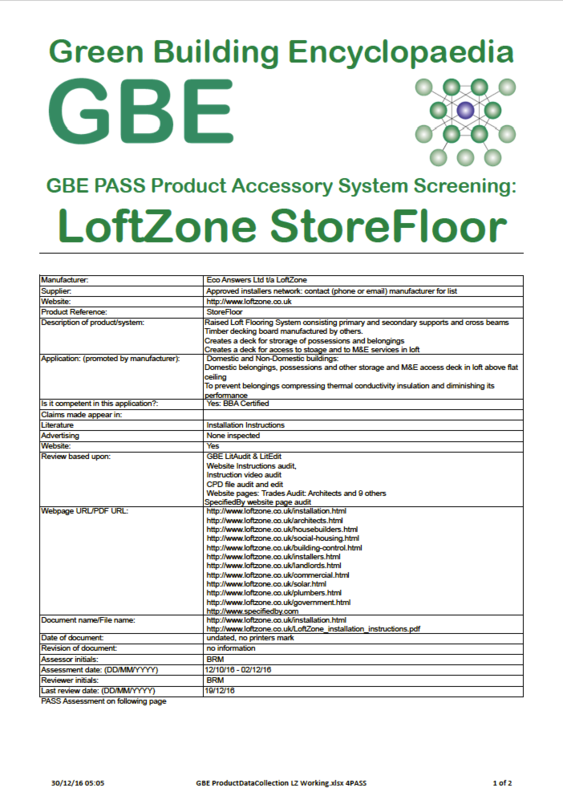 GBE PASS produces a summery document that is available to manufacturers or suppliers for promotional purposes, and is reproduced currently as a downloadable page and in due course as a schedule on the new format Product Page; informing the users why NGS included the product in the Endorsed Products Directory. Any Architect or Designer going about their normal duties does not need LCA to be part of that process, they can and do select appropriate materials, products and methods of construction to suit the location, site, building and their application in elements, taking into account the aspirations of the clients brief and the designers own preferences to create something exhibiting ‘commodity, firmness and delight’. This process may be intuitive, methodical or even calculated, but will result in ‘appropriate competent sustainable construction’. The choices of materials and products may be all-new to them or based on what they have done successfully before and developed with new requirements of a particular project. or if a health spa then they may include water and heat saving technologies. If in the process they have adequately considered all the requirements, then the products they have shortlisted or chosen will be the right products, for the job, fit for purpose. We call this process ‘Screening’ of materials, products or system that are not appropriate, generally and more specifically for the project. We use a traffic light system in the Screening process: green for good and red for bad occasionally a rainbow from green to violet when more detail is needed. ‘GBE PASS Product Accessory System Screening’ filters out inappropriate materials and products, generally and for a project the few left after screening are appropriate. In this process all materials that are regarded by the specifier or their client or their brief to be unacceptable or undesirable are excluded, after screening the resulting products should be free of high impact materials and be dominated by healthy, resource saving, low impact materials or products. With such a small set of screened environmentally sound materials there is no need to carryout expensive LCA and less need to compare alternatives. The process of determining what the average or normal product is in a product group requires collecting together some data about a reasonable number of products in the market place. e.g. lowest to highest, allow the determining and recording of the order of performance between products, using different performance criteria, the products can be judged on one or many criteria; each able to be sorted into order and scored. Scores can even be totalled up to provide a rough and ready comparison; the columns can be totalled and an average performance can be established. This becomes the ‘Average’ or ‘Normal’ around which the products are compared. In reality LCA scores tell you how high or low their impacts are which we can interpret as how good or bad something is, the higher the scores the worse the impacts are, (in GBE Jargon, how ‘Violet’ it is) with LCA you can compare the LCAs of two things, (to find the least Violet) but only if they are from an exactly identical LCA processes. Most current LCA processes are different but the methods and the resulting LCA scores from them will get closer in the future, but remain different for some time yet. The LCA processes usually consist of quantifying the impact of all making and processing of the ingredients and the manufacturing processes, packaging, waste and emissions. 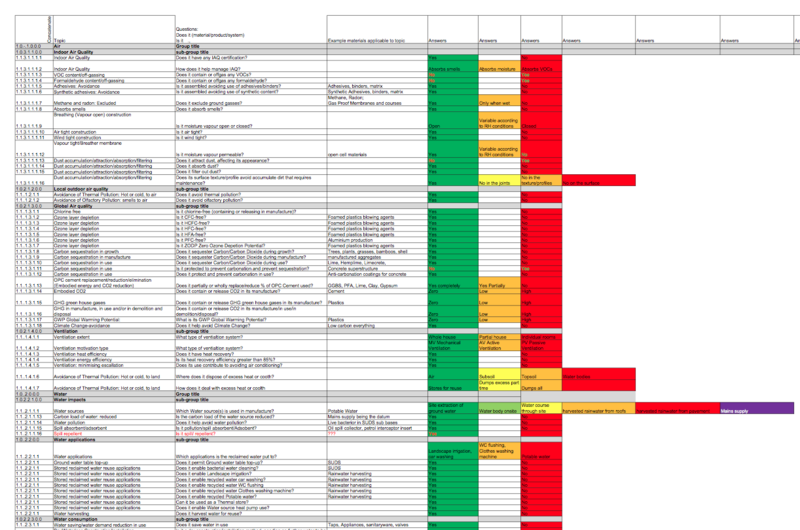 LCA is a detailed process that is not cheap £7,000-£60,000 depending on the product type. LCA does not address indoor air quality and EPD fails to address toxicity of content, so it begs the question how LCA can be regarded as a measure of ‘Greenness’. It is based on LCA, not LCA of products but LCA based on the average output of a manufacturing sector, making conventional materials/products and then aggregated into elemental assemblies and rated F (bad) to A and A+ (good) rather like building EPC Energy Performance Certificates. Individual PVC window manufacturers using virgin PVC (few use recycled) would get no better than a C rating if assessed individually; but as an industry sector generic LCA rating BRE take into account waste PVC is recycled into many products including garden gnomes therefore PVC windows are A+ rated. Most architects would not specify PVC as an unsound environmental material choice, unreliable for ironmongery attachment, preferring more robust and competent products like aluminium and timber composite windows which get a worse C rating in BRE’s Green Guide to Specification. 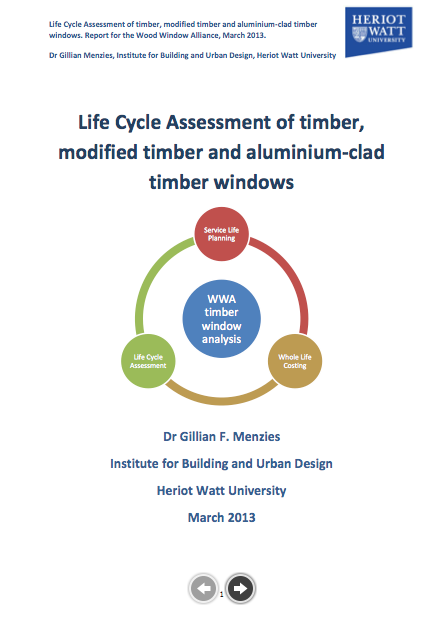 WWA Wood Windows Alliance sponsored PhD paper of LCA compares timber with PVC windows not using BRE’s methods and comprehensively shows Timber and composite to out perform PVC. In the UK, with Design and Build procurement we are lead to believe the constructor is also a capable designer and specifier and we are encouraged or obliged by CPD (Construction Products Directive) and UK authorities to trust them to use their expertise to do their job; but they are also in charge of the costs and these two priorities are potentially (normally) in conflict. Design and Build is usually adopted to let the contractor reduce costs, in reality they reduce costs to increase profit margins at the expense of the quality of the materials, product choices and consequently the resulting building. Strong specification and strong contract administration is needed to avoid the worst excesses of specification reduction or substitution and surreptitious substitution or value engineering (posh for cost cutting) that will occur. 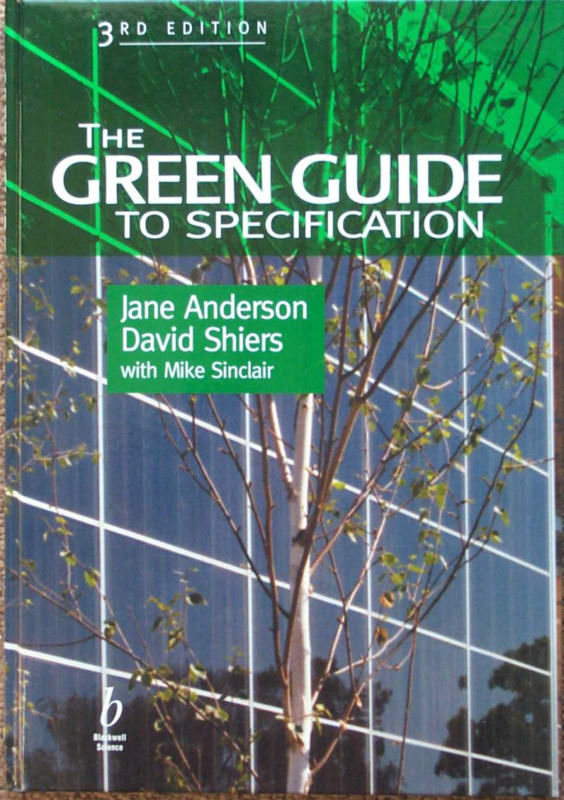 BRE Green Guide to Specification tells the D&B Specifier that PVC windows are A+ rated; they will choose the best LCA and the lowest price ignoring all other performance criteria and result in a high risk short-life window which in the opinion of most if not all greenies is the worse environmental choice. At a BRE event ‘EPD Crossing Borders’ it was pointed out that EPD expressly excludes Toxicity from its assessment. How can EPD be promoted by the EU as a guide to Greenness? LCA should never be used as the first criteria for judging anything, lest make sure it is fit for purpose and can do the whole life job well and economically, first.